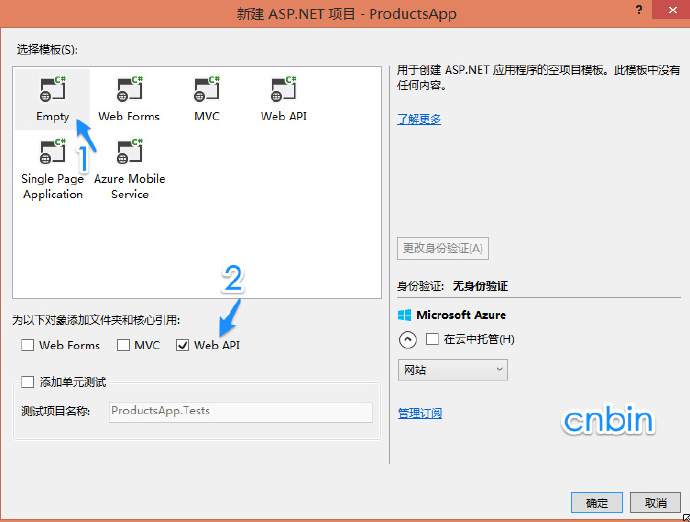 In this tutorial, you will use ASP.NET Web API to create a web API that returns a list of products. The front-end web page uses jQuery to display the results. 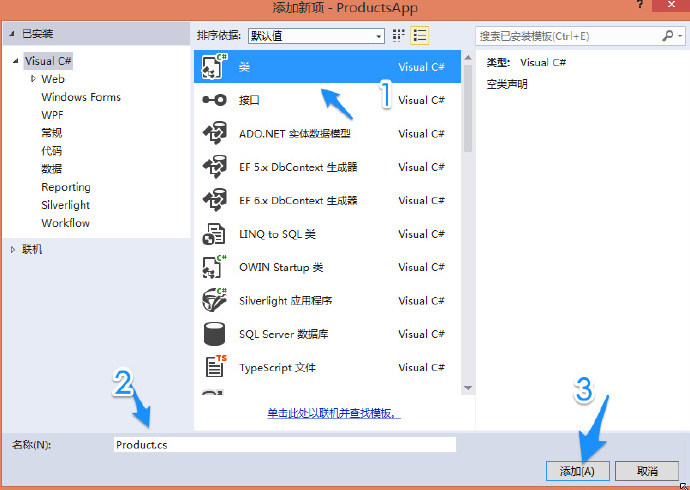 Start Visual Studio and select New Project from the Start page. Or, from the File menu, select New and then Project. In the Templates pane, select Installed Templates and expand the Visual C# node. 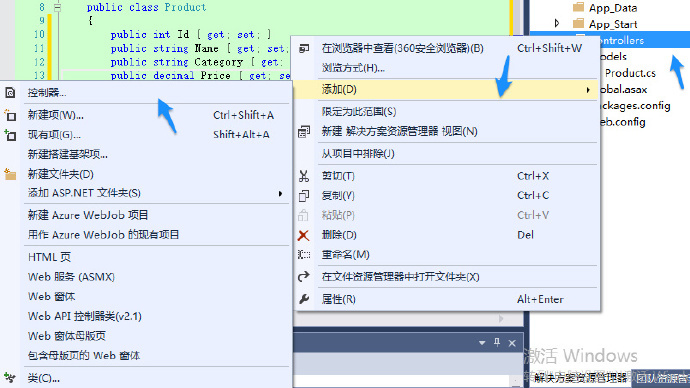 Under Visual C#, select Web. 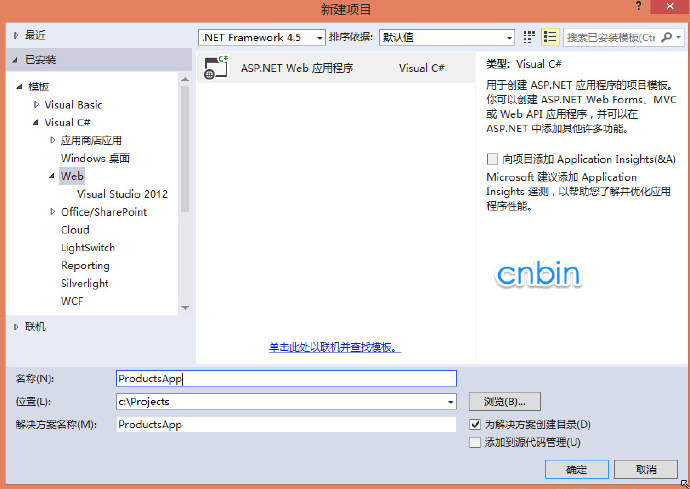 In the list of project templates, select ASP.NET Web Application. Name the project “ProductsApp” and click OK. In the New ASP.NET Project dialog, select the Empty template. Under “Add folders and core references for”, check Web API. Click OK.
You can also create a Web API project using the “Web API” template. The Web API template uses ASP.NET MVC to provide API help pages. I’m using the Empty template for this tutorial because I want to show Web API without MVC. In general, you don’t need to know ASP.NET MVC to use Web API. A model is an object that represents the data in your application. ASP.NET Web API can automatically serialize your model to JSON, XML, or some other format, and then write the serialized data into the body of the HTTP response message. As long as a client can read the serialization format, it can deserialize the object. Most clients can parse either XML or JSON. Moreover, the client can indicate which format it wants by setting the Accept header in the HTTP request message. Let’s start by creating a simple model that represents a product. If Solution Explorer is not already visible, click the View menu and select Solution Explorer. In Solution Explorer, right-click the Models folder. From the context menu, select Add then select Class. Name the class “Product”. Add the following properties to the Product class. In Web API, a controller is an object that handles HTTP requests. We’ll add a controller that can return either a list of products or a single product specified by ID. Note If you have used ASP.NET MVC, you are already familiar with controllers. Web API controllers are similar to MVC controllers, but inherit the ApiController class instead of the Controller class. In Solution Explorer, right-click the Controllers folder. Select Add and then select Controller. 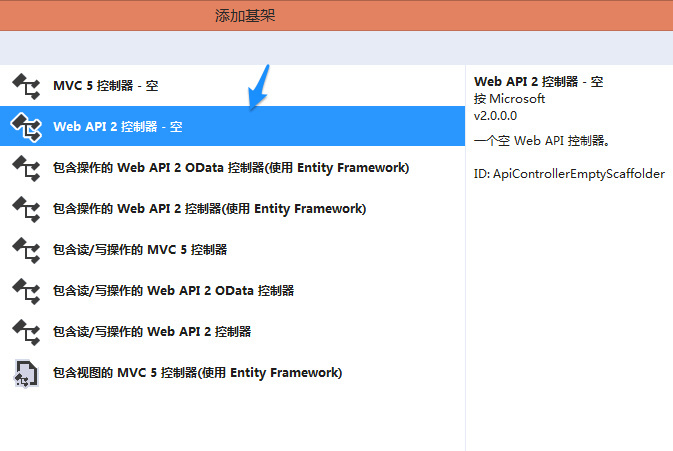 In the Add Scaffold dialog, select Web API Controller - Empty. Click Add. 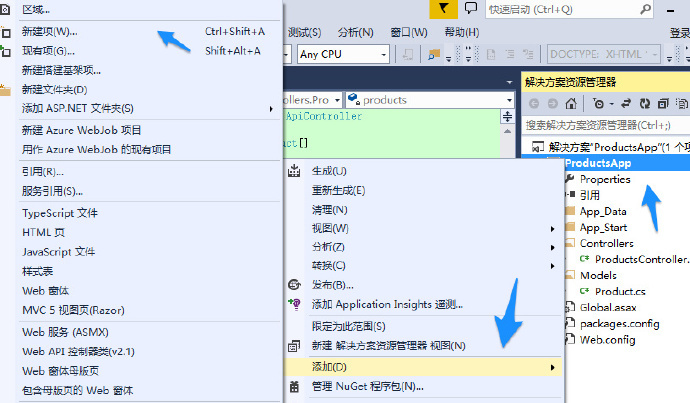 In the Add Controller dialog, name the controller “ProductsController”. Click Add. The scaffolding creates a file named ProductsController.cs in the Controllers folder. You don’t need to put your contollers into a folder named Controllers. The folder name is just a convenient way to organize your source files. To keep the example simple, products are stored in a fixed array inside the controller class. Of course, in a real application, you would query a database or use some other external data source. The GetAllProducts method returns the entire list of products as an IEnumerable type. The GetProduct method looks up a single product by its ID. For the GetProduct method, the id in the URI is a placeholder. 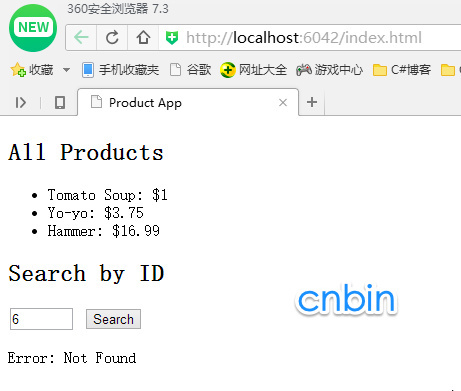 For example, to get the product with ID of 5, the URI is api/products/5. For more information about how Web API routes HTTP requests to controller methods, see Routing in ASP.NET Web API. In this section, we’ll add an HTML page that uses AJAX to call the web API. We’ll use jQuery to make the AJAX calls and also to update the page with the results. In Solution Explorer, right-click the project and select Add, then select New Item. 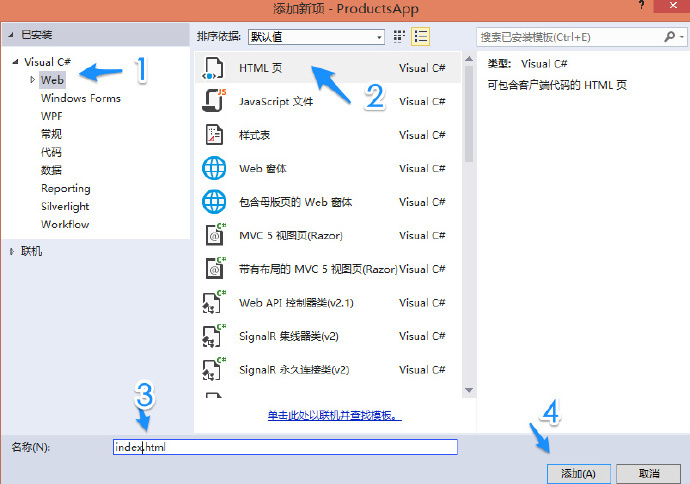 In the Add New Item dialog, select the Web node under Visual C#, and then select the HTML Page item. Name the page “index.html”. There are several ways to get jQuery. In this example, I used the Microsoft Ajax CDN. You can also download it from http://jquery.com/, and the ASP.NET “Web API” project template includes jQuery as well. To get a list of products, send an HTTP GET request to “/api/products”. The jQuery getJSON function sends an AJAX request. For response contains array of JSON objects. The done function specifies a callback that is called if the request succeeds. In the callback, we update the DOM with the product information. 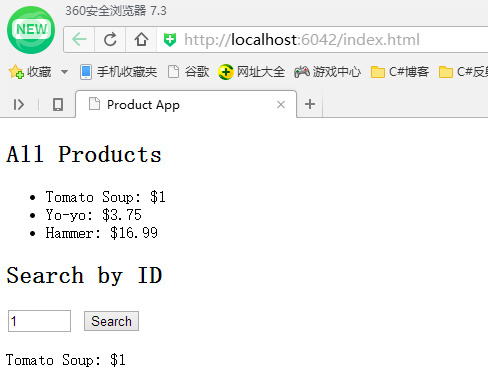 To get a product by ID, send an HTTP GET request to “/api/products/id”, where id is the product ID. We still call getJSON to send the AJAX request, but this time we put the ID in the request URI. The response from this request is a JSON representation of a single product.